BASF’s Construction Chemicals division offers advanced chemical solutions for new construction, maintenance, repair or renovation of structures under the Master Builders Solutions brand. Master Builders Solutions is BASF’s global brand of advanced chemical solutions for construction. The brand builds on the strengths of many legacy BASF brands such as: Sonneborn®, Thoro®, MBT® Protection and Repair, CHEMREX®. These premier products provide joint sealant, waterproofing, grout, concrete repair, water repellent, surface adhesives and wall coating solutions for construction and renovation projects around the globe. CBCP carries most of these in stock or by special order. 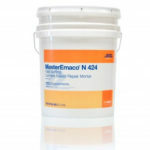 MasterEmaco N 424 is a general purpose, fast-setting, non-sag cement-based repair mortar for small repairs on vertical, horizontal, and overhead surfaces. 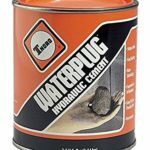 WATERPLUG AKA MasterSeal 590 is a blend of hydraulic cements, well graded sands and additives supplied in dry powder form. It requires only the addition of clean water to produce a ready-to-use, ultra-rapid setting, plugging mortar. Stops active water or seepage under pressure through joints, cracks and holes in concrete or masonry, where a normal mortar would be washed away and resin would not bond. Salmon Bay carries Quart size (2.5 lb) , Gallon (10 lb) and SBSG can special order 50lb Pails.